Rather than trying to compare between Virtual Reality (VR) and Augmented Reality (AR), this article aims at helping you understand how augmented reality works, how it is different from virtual reality, and where and how it is applied. The virtual reality industry exploded in recent years, with the likes of Oculus (Facebook acquired Virtual Reality Company), but recently augmented reality is taking the lead in the game of enhancing communication and the way we do things. Augmented Reality is an enhanced version of reality where live direct or indirect views of our physical real-world environments are augmented with superimposed computer-generated images over a user’s view of the real-world, thus enhancing one’s current perception of reality. These are very big words for what can be explained easily. Simply put; augmented reality takes our natural reality or environment and adds (augments it with) computerized features that makes it easier for us to perform certain tasks. A very good example is as shown in the diagram above. These computerized features include computer generated sounds, graphics and touch. Augmented reality simply augments (adds to) our natural environment without changing it; this is where it differs from virtual reality. Difference between Augmented Reality and Virtual Reality. While virtual reality introduces the user to a whole new different environment, this is not the case for augmented reality; here the user’s physical environment or reality is augmented with computer generated reality (which are simply graphics, sounds, touch feedback etc. as mentioned above). Instead of making you live in an entirely new environment, AR takes our present natural environment, and overlays virtual information on top of it. This is like living in the middle or union of real and virtual environment. With the users of this technology live in an improved world where this virtual information aid our everyday life and activities. 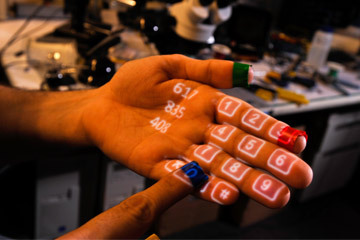 touch a pad or voice commands. AR can be applied for a task as simple as a text-notification and as complex as an instruction set or guide to performing a surgical operation. doctor as well as the patient.